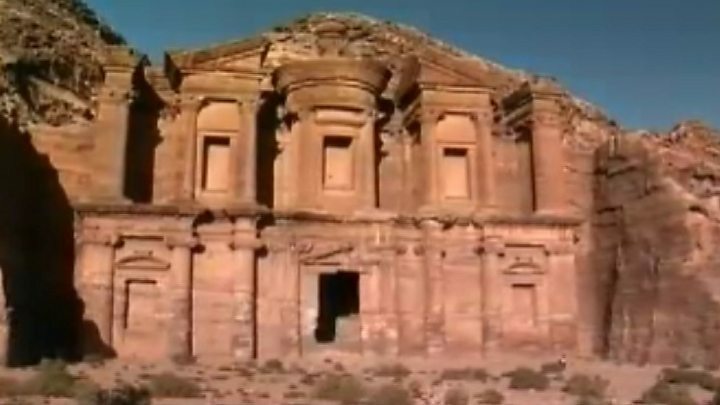 A huge monument has been discovered buried under the sands at the Petra World Heritage site in southern Jordan. 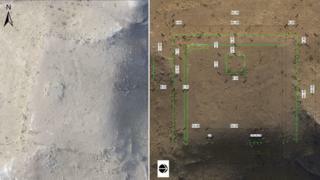 Archaeologists used satellite images, drone photography and ground surveys to locate the find, according to the study published in the American Schools of Oriental Research. The large platform is about as long as an Olympic swimming pool and twice as wide. Researchers say it is unlike any other structure at the ancient site. The study, by Sarah Parcak of the University of Alabama, Birmingham, and Christopher Tuttle, executive director of the Council of American Overseas Research Centers, describes the find as "hiding in plain sight". Petra dates back to the fourth century BC, when it was founded by the Nabataean civilization, who inhabited parts of what is now Jordan, Iraq, Syria and Lebanon. Surface pottery suggests the platform was built in the mid-second century BC, when Petra was at its peak. It is thought the structure may have had a ceremonial purpose. The survey also revealed a smaller platform was contained inside the larger one, which was once lined with columns on one side with a vast staircase on the other. Mr Tuttle told National Geographic that someone in decades of excavation "had to know" the structure was there yet it had not been written up. "I've worked in Petra for 20 years, and I knew that something was there, but it's certainly legitimate to call this a discovery." Hundreds of thousands of tourists visit Petra each year, although numbers have been hit by the conflict against so-called Islamic State. The site is best-known for the Treasury Building, which is carved from sandstone and featured in Indiana Jones and the Last Crusade.